We welcome all visitors and hope our facilities meet each individuals needs. If you have any comments, questions or suggestions about our facilities please contact us. Large lifts are usually available on both sides of the building. We can lend you a wheelchair —just ask at the information desk. There are accessible toilets and baby changing facilities in the gallery. There are two disabled parking spaces at the bottom of Greaves Street, next to the Gallery and Oldham Library and Lifelong Learning Centre. There are also several spaces on the Southgate Street pay and display car park, with access to the Gallery across Southgate Street. More details about town centre parking can be found here. 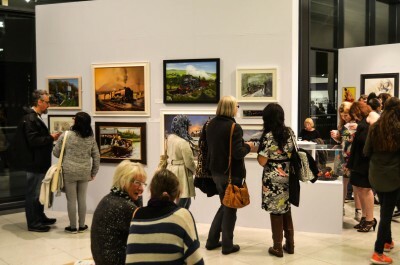 Gallery Oldham is an Autism friendly venue with large accessible lifts, quieter spaces and times and a variety of exhibitions to visit. We are a busy gallery with many visits from school groups, early years sessions and organised tours. We strongly advise calling ahead of any planned visit to ensure a comfortable environment for your trip. For information on our quieter visiting times please call 0161 770 4742. We are a Dementia friendly gallery and museum. All of our staff are Dementia friends trained and we also have a Dementia trail available on the gallery. We also offer a range of creative reminiscence boxes which are available to loan for care homes and those working with groups or individuals in care home settings.